Planning a trip to Venezuela. Pore over the map of Venezuela here before you set sail on your Latin American tour. Northern South America, on the border of the Caribbean Sea and the North Atlantic Ocean. Its neighbours are Brazil, Colombia and Guyana. Also off its coast to the east is Trinidad and Tobago. To its north are the Lesser Antilles and the Dutch colonies of Aruba, Curacao and Bonaire. Nadir point: Caribbean Sea at Mean Sea Level Highest point: Pico Bolivar 5,008 metres altitude metres. Venezuela is strategically located on major sea and air routes which link North and South America. The Angel Falls in the Guiana Highlands is the highest waterfall in the world. If you are visiting Venezuela you may need to buy yourself a map. Venezuela Map by Publishers Treaty Oak. Amazon endeavour to ship to you within twenty four hours. The map is one page and is published by ITMB Publishing. This is the 2nd edition and dated January 1, 2000. This map of Venezuela, Ecuador and Colombia and features the main tourist attractions and major road networks. It uses hillshading and layer colouring to accentuate the contours. Map Scale is 1:4 000 000; 1 centimetre to 40 kilometres; 1 inch to 63 miles. The map also highlights areas of natural interest and beauty, local activity centres and the most important transport links, covering the whole of the country of Venezuela. Useful features on this map of Venezuela include detailed city maps of the capital Caracas, as well as the Ecuadorian cities of Quito and Guayaqil, and maps of Colombia's Bogota and Cartagena. The map features a distance chart between major centres in these countries and a detailed index of important place names of villages, small and large towns and main places of interest. Useful for an independent traveller for both planning purposes and having with you on that trip. Berndtson & Berndtson Venezuela Map by Berndtson & Berndtson Verlag Publications; International Standard Book No classification: 3897075725 B&B GmbH is a German cartographic publishing group based near Munchen (Munich), Germany. Their maps are made with non-hazardous lamination material that is biodegradable. Scale of their map of Venezuela is 1:1,750,000. Index: Map of Venezuela. Masses of Facts and Figures on Venezuela. 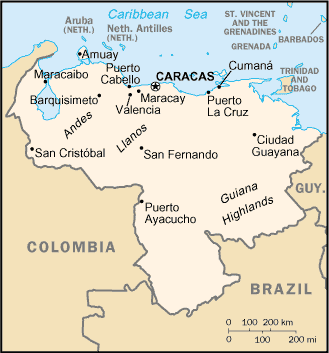 Map of Venezuela from Cia World Factbook.